FILE - Ben Kingsley attends the premiere of "Operation Finale" at the Walter Reade Theater in New York, Aug. 16, 2018. Ben Kingsley said he didn't portray Adolf Eichmann out of love or admiration. Rather, he wanted to "nail him to the gates of Auschwitz." The Oscar-winning Kingsley, who has tackled historical figures before, including Mahatma Gandhi, Otto Frank and Simon Wiesenthal, said playing Eichmann in "Operation Finale" produced an entirely different feeling in him. "With Gandhi, I loved him. With Simon, I loved him. With Otto, I loved him. With Itzhak (Stern), I loved him. But him — I'll nail you to the gates of Auschwitz. I'll put you up there so everyone can see what you did, what you stood for and who you are," Kingsley told The Associated Press in a recent interview. "I put him into the camera for you to judge him, for you to see. I've let go of him and I dedicated my performance to Elie Wiesel and the millions who lost their lives under his command," Kingsley said. "Rather than saying to the man that I portrayed, 'I am doing this for you,' because I certainly wasn't, I used to say to Elie Wiesel, 'I'm doing this for you,' because I know that Elie and other survivors said quite rightly that if we forget the six million, we are murdering them all over again." In the film, the rhetoric spoken by Eichmann bares an eerie similarity to the vicious debates currently surrounding the immigration issue in the United States and across the globe. Kingsley sees the film as a cautionary tale and hopes that audiences "will have thoughts after the seeing the film that they did not have before." 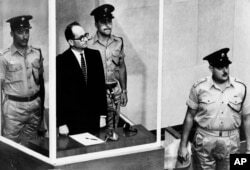 FILE - Adolf Eichmann is seen standing in his glass cage, flanked by guards, in the Jerusalem courtroom during his trial in 1961 for war crimes committed during World War II. After protests by neo-Nazis and white supremacists last year in Charlottesville, Virginia, Kingsley thinks it's important to not forget the lives lost in the Holocaust, so it doesn't happen again. "Memory is vitally important, truth and memory. I'm quoting now Elie Wiesel, whom I met on several occasions. I loved his company. It was definitely being in the company of what I would say would be comparable to an Old Testament prophet. I felt that also when I was in the presence of Simon Wiesenthal for all those months when I portrayed him. And Simon, quite clearly said that it could happen again. And so did Elie in his heroic pessimistic moments." "Star Wars" star Oscar Isaac took a break from shooting the latest installment in the franchise to attend the recent New York premiere of "Operation Finale." "I flew in from a galaxy far, far away where we're shooting in London," he said. "You start to hear a lot of similar language, and it's so, so powerful what a demagogue can do. How he can whip up just normal people, not monsters, not psychopaths — just regular people to hate," Isaac said. "We have to be aware of the fact that holocausts are still going on and that we must do our part to protect people from genocide," he said.